The home of Sunderland is very new to League One and teams that visit here will treat it as a day out reminiscent of a cup final. The 49,000 capacity of the Stadium of Light is a modern stadium that sees the second tier travel around half of the stadium. Away fans will be located in the South Stand and all fans have an excellent view of the action, as you would expect from a top-class stadium. Outside the stadium, you will find a statue of the teams 1973 FA Cup winning manager, Bob Stokoe. The stadium is massive in size and is totally enclosed. The Stadium of Light is composed of two, three-tiered stands; there are the North end and the West. The remaining other stands are two-tiered and these are called the West Stand which hosts the executive boxes, these are located just below the top tier. When viewing the stadium from the South Stand, the stadium looks massively imbalanced with all of the stands looking different from each other. Around 3,000 away fans can be expected at the Stadium of Light and they are typically located in the heavens in the top tier of the North Stand behind one of the goals. The view of the game is as good as you will get in the division and you have a lot of space to move. The facilities and services on offer are what you would expect from a previously Premier League stadium. There is great difficulty is parking near to the ground, there is a large car park at the stadium but this is normally reserved for permit holders which are typically Sunderland season ticket holders. The club does however operate a free car park and shuttle service, with the service buses running every five minutes beginning an hour and a half before kickoff. You can always park in the town centre which is only a ten-minute walk from the stadium but be warned there is normally a lot of traffic on match days. The best train station to aim for when attending the game on the rails would be Sunderland as this is only a ten-minute walk away from the station. The easiest way to get to the station is via Newcastle main station. Due to the clubs steep decline from the Premier League to League One, there are no tickets more expensive for adults than £20. 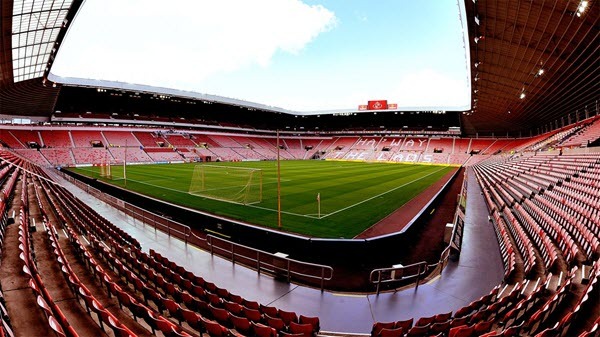 Over 65’s will pay £17.50 for match-day tickets, while under 16’s will have to pay £7.50 to see Sunderland play. There are also Select packages for individual matches to suit you and your guests while enjoying the keenest prices around in hospitality. There are five options all ranging in price in terms of hospitality, these options are Quinn’s Sports Bar, Black Cats Bar, the Montgomery Suite, the Riverview Brasserie and a number of Executive Boxes. The Club offers daily tours of the stadium, except on match-days. These cost £10 for adults and £5 for concessions. You can always opt for a family ticket (2 adults + 2 children) which is available at £25. The club has recently secured planning permission to add another 7,200 seats to the Metro FM (South) Stand, which would take the capacity to 55,000. If the club then proceeds after this to add another tier to the McEwans Stand the final capacity would be around 64,000. Much of this would be dependent on which league the club are playing in. This entry was posted in League 1 and tagged Stadium Of Light, stadiums, Sunderland. Bookmark the permalink.